A Special CBI court on Saturday granted regular bail to former Railways minister Lalu Yadav in the IRCTC scam case. New Delhi: A Special CBI court on Saturday granted regular bail to former Railways minister Lalu Yadav in the IRCTC scam case. Special CBI judge Arun Bharadwaj directed the Rashtriya Janta Dal (RJD) supremo to furnish an amount of Rs 1 lakh as a personal bail bond and one surety of like amount. Yadav is already on an interim bail while the other accused in the case are on regular bail. Meanwhile, in the case filed by the Enforcement Directorate, order on regular bail plea is already reserved by the court and listed for hearing on January 28. 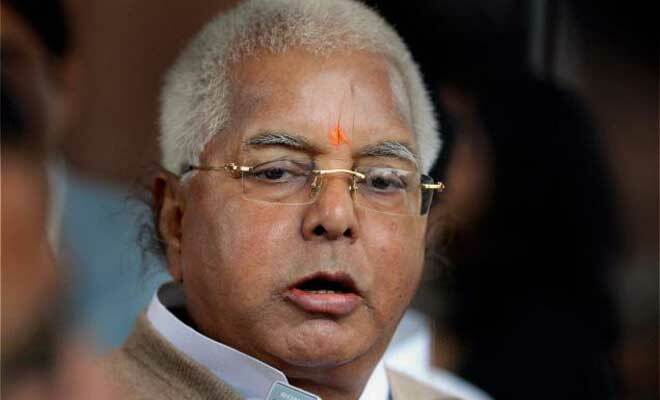 Lalu is facing charges of misusing his position in the allotment of a contract to a private company for the maintenance of two IRCTC hotels located at Puri and Ranchi. The prosecution report had stated that the two hotels of the Indian Railways were first transferred to IRCTC and was sub-leased to the Sujata Hotel Pvt. Ltd owned by Vijay and Vinay Kochhar for maintenance. Meanwhile, the Enforcement Directorate (ED) also filed a reply in the Delhi Court and opposed regular bail plea to all the accused in the case including Lalu, his wife Rabri Devi, son Tejashwi and others. ED in its reply said that the offences were affecting the economy, thereby posing the serious threat to the financial health of the country. Whereas Counsel for Lalu and family said, no one arrested during trial.